Move the slider to shift one wave relative to one another by a fraction of a wavelength. The red wave is the superposition of the two waves. When there is no shift of one wave relative to the other, the waves add constructively. If the waves are shifted relative to one another by half a wavelength, the waves add destructively (i.e. the waves cancel one another) If the waves are shifted relative to one another by a full wavelength, the waves add constructively again. 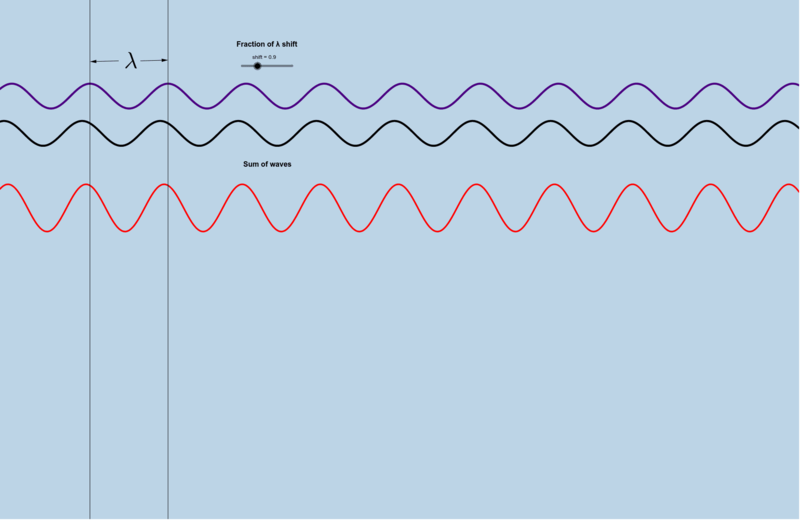 What happens if the waves have a relative shift of 1.5 wavelengths? 2 wavelengths? The shift of one wave relative to the other may be the result of one wave travelling a longer path than the other in reaching the point in space where they interfere, as in the case of Young's double slit experiment.